← The Sports Archives – Top 6 Most Scenic White Water Rafting Locations! When it comes to football, many people love the sense of tradition more than they love the modern game. There are a number of people who claim to have fallen out of love with the modern game but even in the era of multi-million deals and TV contracts that run so long they can be confused for telephone numbers there are ways that people still feel connected to the game. The start of a new year provides the platform for the FA Cup to shine and many people are still in love with “the romance of the cup”. One of the most appealing elements of the FA Cup is the opportunity for small teams to welcome a big team to their home ground. There is something extremely pleasing at seeing the modern-day footballer struggling at a traditional style ground with the most basic of conditions. The hope of a big team losing to a small team is always great fun for most football fans but just the juxtaposition of the two teams and situations is always worth watching. Cambridge United have been drawn against Manchester United, following on from Yeovil Town, who were handed a home tie against the leading team from the English Premier League. There is always going to be a huge level of demand for these games. United are well-known for having a strong travelling support and Cambridge United fans, and plenty of people in the local community clamour for tickets. There is no way that the supply of tickets can meet the demand for tickets for this style of match and it seems as though Cambridge United experienced a few problems in the run up to the match. This can be seen with the fact that the club has made an official complaint about a website that has been offering fake tickets for this match. Trading Standards have been informed that there is a website offering fake tickets for the game that is scheduled to take place on the 23rd of January. The safety officer of the club, Ian Darer, released a statement saying that he found a ticket for the Main Stand of the ground on offer for £280. This was on a site that is located in the United States of America but the Trading Standards team in Cambridgeshire have announced that they are looking into the sale of these tickets. The club reiterated that the only way to obtain a ticket for the home end of the grounds was through Cambridge United and all of the home end tickets had subsequently sold out. Manchester United tend to deal with their own tickets and their own fans would have provided more than enough demand for the away end allocation of tickets. The local newspaper in Cambridge has carried out their own investigation into the sale of match tickets and they have found that the match tickets, on sale between £20 and £35, have been selling for as much as £260. The match is also going to be screened on BBC One and it will be the first meeting between the two sides since 1991. This isn’t the first strange ticket story that has arisen over Manchester United’s involvement in the FA Cup this year. In the previous round, United were drawn against Yeovil Town or Accrington Stanley, with the team in green and white hoops winning a replay to clinch the money-spinning tie. However, Accrington Stanley decided that they wanted to earn some money from a game that didn’t actually arise and they issued commemorative tickets, priced at £20, to reflect the fact that they nearly got to play against Manchester United. While no one is being forced to buy these tickets, you have to wonder if anyone would actually want to buy it. Any Accrington Stanley fan that bought this ticket would have a permanent reminder that their club fell just short of getting a tie that would have given the club a sum of money that would have kept them secure for a good while. This may not be the toughest case that Trading Standards have to deal with this year, but with football being such an emotive subject, you can bet that there will be some staff in Cambridge taking a great level of interest in this. Wherever there is an opportunity to make money, it is inevitable that people will jump in to try to make money themselves. This often leads to illegal or fraudulent activity and in this regard, the rules are quite clear about the sale of these match tickets. 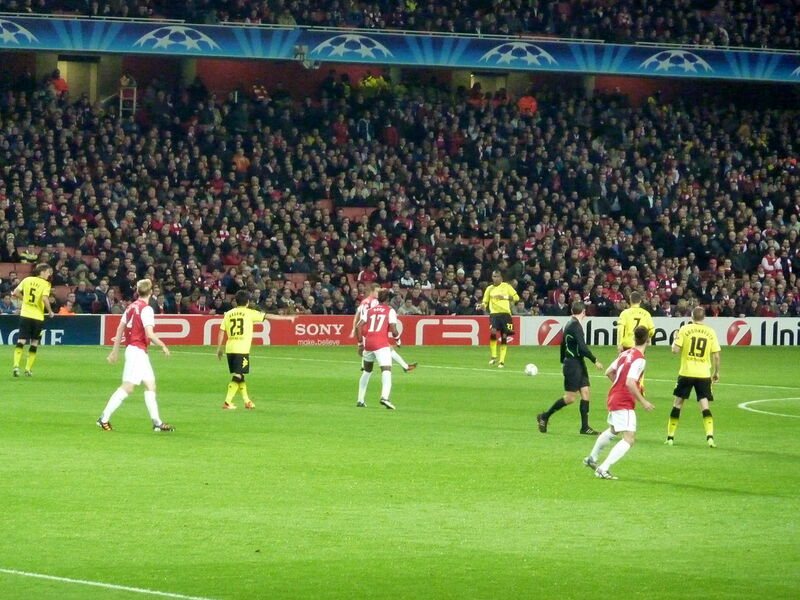 “Arsenal vs Borussia Dortmund” by wonker – Flickr: Arsenal vs Borussia Dortmund. Licensed under CC BY 2.0 via Wikimedia Commons. This entry was posted in Soccer and tagged Accrington Stanley, Cambridge United, English Premier League, FA Cup, football soccer blogs, manchester united, sports and leisure, Sports Archives, Sports Blogs, Yeovil Town. Bookmark the permalink.